I was always looking for the latest batting drills to help me fix my swing problems. Most likely you have used some sort of baseball drill in your life which probably revolved around hitting. Baseball batting drills have been around since the beginning of baseball and is a great way to work on problem areas of your swing by letting your body make the necessary adjustment without letting your mind get in the way (more on that to come in a future post). A common misconception I have seen as well as experienced myself is a coach telling me to do certain drills that I have done before. I would think to myself, “I have done these drills in the past and my swing is still faulty, how are they going to help me now?” I was always looking for a new drill that I have never seen before that would help me get over the hump. Fast forward 5 years. As I watch some of the best hitters on earth do their work behind the scenes, I’ve made a couple observations. I watch the drills they are doing and learned most of them are pretty basic batting drills that you and I have done before. So what gives? There are two differences between what they are doing and what I was doing. 1. They did the drill perfectly and had a plan for every swing. In the game there are no “do overs” so in our minds every swing counts. Contrast this with the batting cage, where players often find themselves “just going through the motions”. 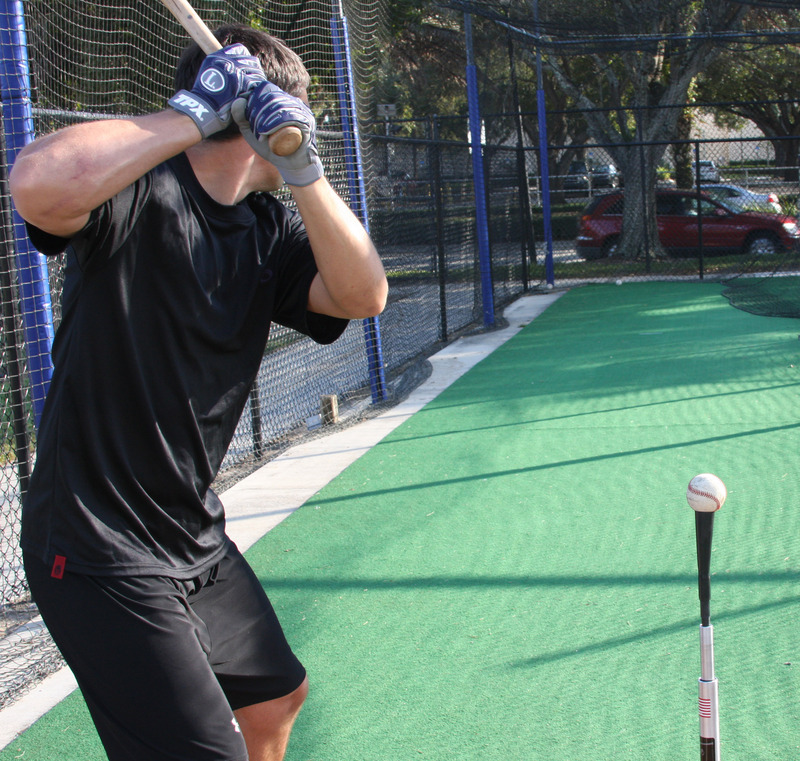 Sure, it’s tough to hit 100 balls in the batting cage and fully concentrate on every swing, but that is exactly why you might be wasting your time. How many times in a row can you hit a line drive to the back of the net in the cage? It is important to make your practice perfect. Line drives are the goal. No balls should hit the top net in the cage, you shouldn’t roll over any balls (ground balls to the pull side) especially off the batting tee. If it does happen, don’t hit 5 more just like it before you bother to make an adjustment. Have a plan and take it seriously. Even players that seem on television to have a non-caring, always-happy attitude take their cage work seriously. The best players in the world are doing the same drills as you, but they are doing them perfectly. It’s on us to make every swing important. 2. They know why they are doing a drill and how to execute it properly. Doing a drill just because someone suggested that particular drill doesn’t make sense. Think of drills as custom to your swing. If you have problems with inside pitches and you pull the ball incorrectly, there is a drill for that. If you tend to pop up weakly to the opposite field, there is a drill for that. 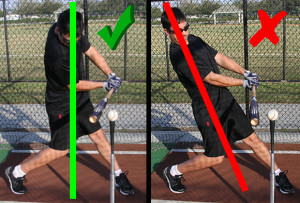 If you have trouble maximizing your bat speed and don’t quite get to a strong launch position, there is a drill for that. Here’s an example: If you are having trouble with too many swings and misses, or rolling over and hitting ground balls, you might be opening up your shoulders – the Kick Back Drill is designed to help hitters fix that problem. Do accurate self-evaluation and talk to others that will be honest with you. Once you know your weaknesses you can address them and work on them through drills. Common mistakes for the Inside Tee Drill (exaggerated for demo purposes); Taken from newly released book. Click to learn more. Being able to execute the drill properly is very important. You can watch a drill and try to reproduce it, and even make it look like it should. However, if you don’t really understand what the drill is meant to accomplish, you could be wasting your time. Often it’s little things such as hand position at contact, where the batting tee is set up, or the common mistakes to avoid that make batting drills effective. Doug’s Philosophy. I believe in doing drills, but I want to be more specific. I believe in doing certain drills that will help the deficiencies in my swing; and I believe in doing them properly over and over again. I would rather have 2 or 3 drills I do everyday and become unbelievable at them than to know 15 drills and do them sparingly and be average at them. When we do our hitting drills, we should have a specific plan as to where we want to hit each baseball. Think of every swing as important as it would in the game. Remember there are no “do overs” in a game. Ok, this is where I’m going to self-promote. Over the last couple months I’ve worked hard putting together a book of baseball hitting drills for a batting tee. (And no, the batting tee is not just for young kids. Many of the best Major League hitters still use the batting tee as part of their every day routine.) The book comes with free videos, full color illustrations, and some pretty cool bonus stuff. As you know, all the baseball instruction on this website is free, and it’s projects like this that are going to help us keep it that way. If you’ve already bought the book, I would just like to say a sincere thank you for your support.